Bottled mixed drinks have never enjoyed a glowing reputation. I don’t think I’ve ever tried one of those pre-mixed margaritas or daiquiris that can usually be found coated with a layer of dust on the bottom shelf of a liquor store; so, in truth, I can’t say I know they’re terrible. But in the same way that I don’t have to eat a forkful of cat food to know it’s not for me, I’ve always felt comfortable dismissing the pre-mixed cocktail genre in its entirety. It may seem ironic, then, that in this era of handmade cocktails and fresh ingredients, bottled cocktails are experiencing an upswing in popularity and, more importantly, quality. Plenty of bartenders have been experimenting with carbonated, pre-mixed drinks, and several respected liquor producers have attempted to capture the complexity and freshness of a good cocktail, bottle it, and put it on store shelves. On one end of the spectrum, there’s Charles Joly, a world-renowned bartender willing to put his name on his own line of bottled cocktails. On the other end, you’ve got those abominations I keep seeing Budweiser advertise, which I guess are maybe beer or some malt beverage that tastes like a cocktail? Honestly, don’t even tell me; I really don’t want to know. 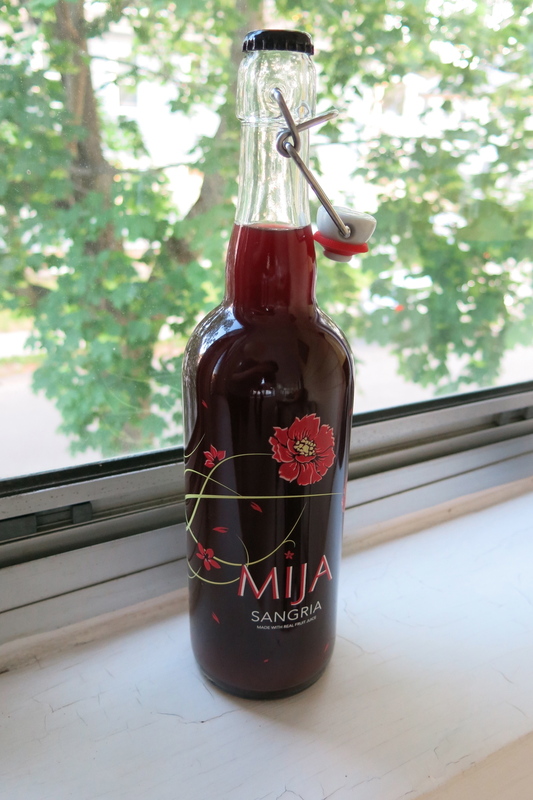 And so it was with a mix of optimism and skepticism that I approached Mija Sangria, a bottled sangria made by Latitude Beverage Company, the founders of 90+ Cellars. I received a sample of this bottled sangria earlier this month, just in time for the very type of weather that calls for this refreshing wine-based libation. My first thought was this – why go to the trouble of bottling something that’s as easy to make as sangria? (Actually, that’s not true; my first thought was “free booze delivered to my door, YES!!! !”) All you need is a halfway-decent red wine, fresh fruit, maybe some soda, and you’re on your way. Why not bottle something that takes a more practiced hand or requires ingredients that the casual home bartender may not want to invest in? On appearance alone, Mija makes a winning first impression. The bottle is beautifully designed, and its resealable flip-top means you can reuse it. Further, the screen-printed label makes a strong case for the bottle’s contents, describing the sangria as a premium red wine blended with genuine, natural, unfiltered fruit juices. The accompanying product description sounds promising too – no artificial additives, plenty of antioxidants from fruits such as pomegranate, açai, and blood orange. Of course, like so many things in life, it’s what’s inside that counts. And I’m happy to say that despite my reservations…it’s pretty good! First off, it’s actually a sangria, not some flavored mix masquerading as the timeless summertime beverage. It’s full-flavored and well balanced, with a fresh aroma and a very natural fruitiness. The product description promises pulp, just like a homemade sangria. I was disappointed not to find any in my bottle, but it did have a thick, rich consistency that compensated for any lack of texture. My only real criticism is that it’s too sweet for my taste. Many sangria recipes call for brandy, and I think that’s what’s missing here – an ingredient that adds some complexity, balances the sweetness, and gives the drink some bottom. I didn’t have any brandy on hand, but experimented with adding a little dark rum. While I didn’t get the proportions quite right, it did contribute some depth. And the Mija folks actually encourage that sort of experimentation. Although it’s bottled ready to drink, the serving notes suggest it can be used as a cocktail ingredient or as a base for your own sangria. So if it feels incomplete, depending on your taste, it will stand up to some customization. Given the choice, I’m always going to prefer making my own sangria. I get excited about spending hours looking up the best recipes, experimenting with different batches, and eventually settling on my own interpretation. But I realize not everyone has the time or inclination for that. Plus, the best homemade sangrias tend sit for a while to let the flavors come together, and it’s hard to argue with the comparative ease of grabbing a bottle at the liquor store on the way to a summer party. In that respect, I can definitely understand the appeal of a quality bottled sangria. And while I may quibble with the sweetness and crave some more complexity, there’s one thing about Mija I should make abundantly clear – if you simply handed me a glass of it, I would never guess that it came from a bottle. Nothing about it tastes, smells, or looks processed, and being able to capture that freshness is a genuine achievement. Note: The bottle of Mija sangria I received was complimentary. I was not asked or expected to review or promote it in any way, shape, or form.